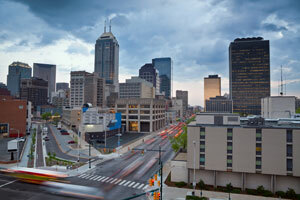 Indianapolis is home to over 800,000 people and has been named one of the best downtowns in the nation. In addition to a thriving downtown full of retail shops and dining, a tourism industry continues to grow. This makes Indianapolis a perfect market full of effective advertising opportunity. There are also six official cultural districts which allow for specialized advertising to target your audience. Some of these are Broad Ripple Village, Indiana Avenue, and Fountain Square. Indiana is also home to festivals such as the Indy Jazz Fest and the Indianapolis 500, both of which bring thousands of visitors to the city. Well placed out-of-home advertising near these areas would expose your business to a high amount of traffic. The freeways servicing the city are another billboard option. Billboards on Interstate 65, Interstate 69, or Interstate 70 are just a few examples of the advertising possibilities Indianapolis has to offer. Zip Codes: 46201, 46202, 46203, 46204, 46205, 46206, 46207, 46208, 46209, 46211, 46214, 46216, 46217, 46218, 46219, 46220, 46221, 46222, 46223, 46224, 46225, 46226, 46227, 46228, 46229, 46230, 46231, 46234, 46235, 46236, 46237, 46239, 46240, 46241, 46242, 46244, 46247, 46249, 46250, 46251, 46253, 46254, 46255, 46256, 46259, 46260, 46266, 46268, 46274, 46275, 46277, 46278, 46280, 46282, 46283, 46285, 46290, 46291, 46295, 46298.